COOPER ENERGY has made a final investment decision (FID) for the Sole gas project following the announcement of a fully underwritten finance package to complete funding for the project. The finance package includes AUD 250 million senior secured bank debt facility fully underwritten by Australia and New Zealand Banking Group (ANZ) and Natixis, Hong Kong Branch, a senior secured AUD 15 million working capital facility provided by ANZ and a fully underwritten accelerated non-renounceable entitlement offer to raise approximately $135 million. Cooper Energy managing director David Maxwell said: “Today’s FID declaration is the culmination of 5 years’ effort under our gas strategy to identify, secure and develop gas resources best placed to supply south-east Australia with a new source of gas supply. On current equities, Sole will deliver gas sales of 24 PJ or 4 million barrels of oil equivalent (boe), per annum to Cooper Energy, roughly four times the company’s production in FY17, the company said. Approximately 75% of the field’s gas has been contracted under long term agreements with AGL Energy, EnergyAustralia, Alinta Energy and O-I Australia. Declaration of Sole FID fulfills one of the principal outstanding conditions for the completion of the agreement with APA Group, whereby APA will acquire, upgrade and operate the Orbost Gas Plant to process gas from Sole. The company’s gas sales agreements with AGL, EnergyAustraila, Alinta Energy and O-I Australia were subject to Sole FID. This condition precedent has accordingly been satisfied. 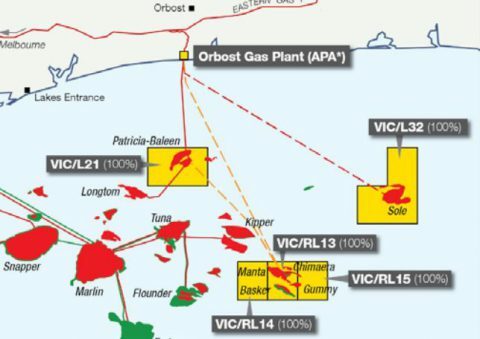 Sole is located in VIC/L32 the Gippsland Basin, offshore Victoria, approximately 65 km from the Orbost Gas Plant. Cooper Energy is the Operator of VIC/L32.